Overview: After cutting ties, a brother and sister are brought together after near tragic events disrupt their lives, reflective conversations and contemplation ensue. Roadside Attractions, 2014, Rated R, 93 minutes. 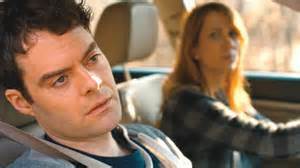 Quietly Intelligent: Contrary to what their status as twins might immediately lead you to think, Maggie (Kristen Wiig) and Milo (Bill Hader), exist on the verge of complete opposites. This film embodies themes of dualities and opposites; in order for two things to become close, they must first be distant. In order to live, they must die. One twin lives on the eastern coast and the other on the west. There is presented an uncanny connection, perhaps to suggest extrasensory perception, as both attempt to say, “See you later.” Craig Johnson shows great intelligence as a director, exemplified in the way he moves the audience toward the dark depths of suicide, and then yanks us back to the surface for a breath of humor. In a near-ingenious move of opposites and contrasts, Maggie and Milo are most alive on All Hallows Eve, a day dedicated to the dead. Johnson works with great faith in his audience, allowing them to understand without him having to explicitly state. In many movies with flashbacks, the recalled event is as cacophonous as the word “flashback;” it’s abrupt, a shock, disruptive to the narrative process. Johnson seamlessly stitches the memories of the past to the current events without jarring transitions, sometimes to a point of confusion. At times, you cannot tell whose memory belongs to whom. That may be the point. Both twins share the same memory. “We cannot live only for ourselves…” The Skeleton Twins captures everything I hope my own relationship with my siblings would be and everything that I would not want it to be. Maggie and Milo are crazy, unbalanced, and a little off in the head. Wiig’s portrayal is strongest in her emotions. Many times a rant or a lengthy explanation could fill the quiet, but why have a monologue when Wiig’s terse lips or awkward side-glance says all that needs to be said? Early in the movie, Maggie says, “I see you’re getting your sense of humor back.” Milo replies, “Yeah, they can’t take that away from me.” Hader’s candid humor is perfectly packaged in his posture and judgmental comments. Surprisingly, the dual and dueling energies bring about an emotional connection that other family dramas fall short of accomplishing, until ultimately, a strong message develops from and in spite of the repetition of opposites: only family will save you.